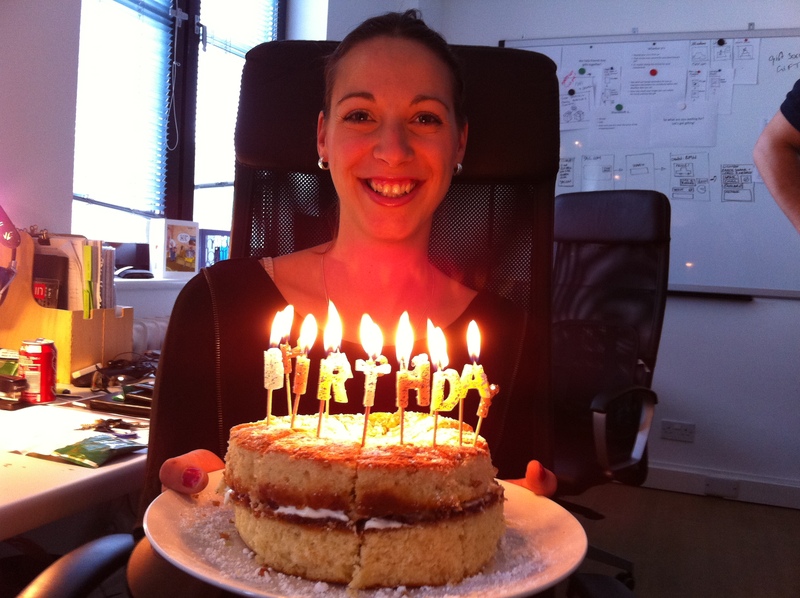 Major excitement, last week we had our first team member birthday in the office – Happy Birthday Becs! With some trepidation, the marketing team (for which read: yours truly) took on the mantle of cake-baking – not something that comes naturally to me I’ll confess, but it was met by a beaming birthday girl quickly demolished by the team so can’t have been all that bad! And of course we Share(d)AGift. Becs is an absolutely amazing cook so we clubbed together to get her some snazzy stuff for her kitchen from an uber-trendy kitchen shop in Primrose Hill. Hopefully in a matter of just a few weeks we’ll be able to celebrate another birthday using the site to share the prezzie. Til then, here’s a quick snappette of our very own beaming Becs on her big day. Enjoy!